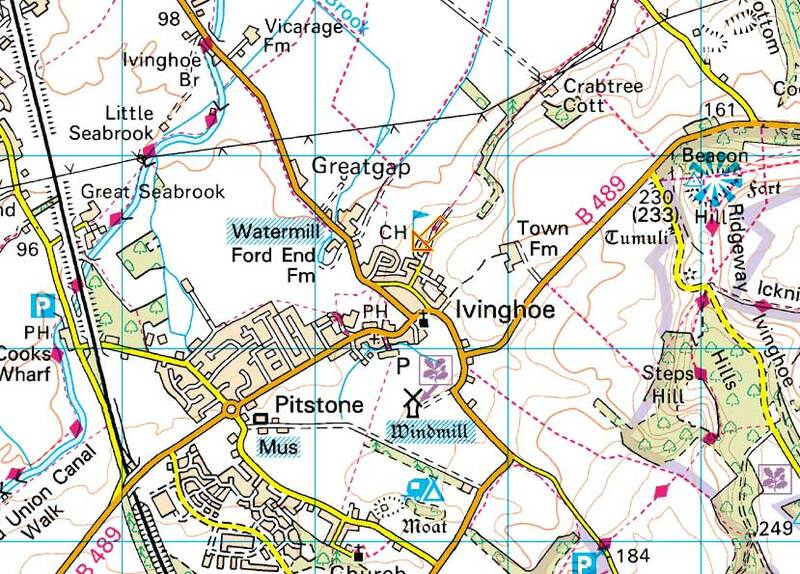 By some miracle, she was born 4 days before the census taker visited her family home at Greatgap in Ivinghoe. He noted that "Mary" (Maria) was living with her parents and older brother Thomas. Next door were her aunt & uncle Ethelred & Rachel (Simons) Collyer and on the other side her grandparents Jesse and Mary Simons were working Vicarage farm with her grandfather's brother Jonathan Simons. 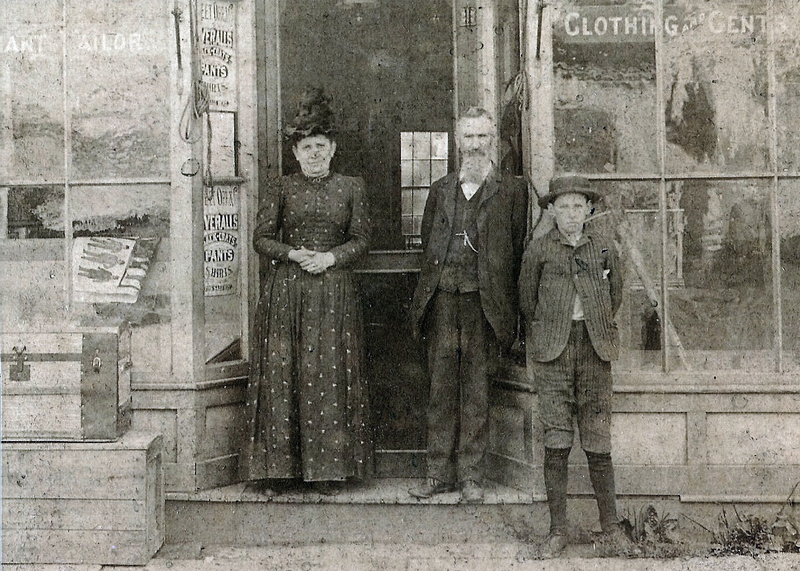 The same confusion can be had about Maria's meeting of her husband and their marriage in the nearby village of Berea. I can only make assumptions as North Royalton and Berea had 2 towns and about 10 miles between the villages... and plenty of other tailors. We are able to glean from the wording of Maria's obituary that she was not from Berea and didn't live their until she married. Shortly after Maria's marriage to Ed, Maria's parents and the rest of the Simons family picked up and relocated from Ohio to the wilder frontiers of Iowa to answer the call of manifest destiny and claim cheap land of their own. 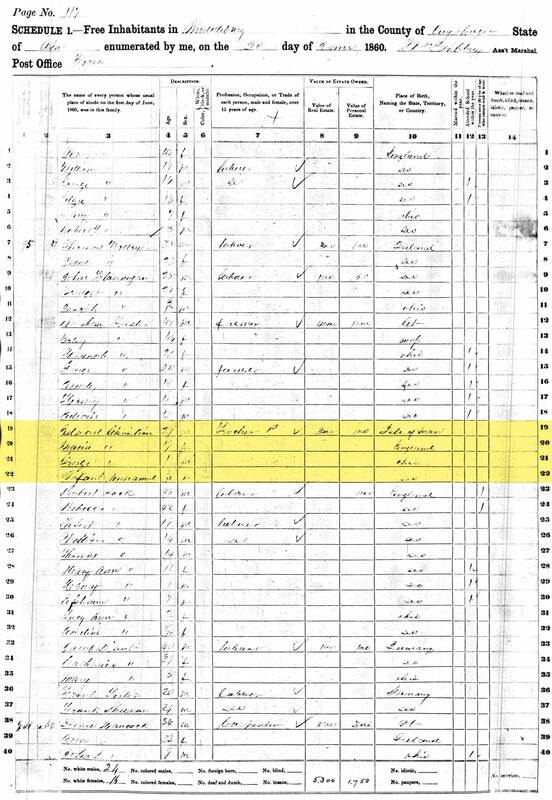 A A cousin with closer connections to Maria (my ancestors lost touch with the majority of Ed Christian family after George died young) relayed her middle name as Susan. 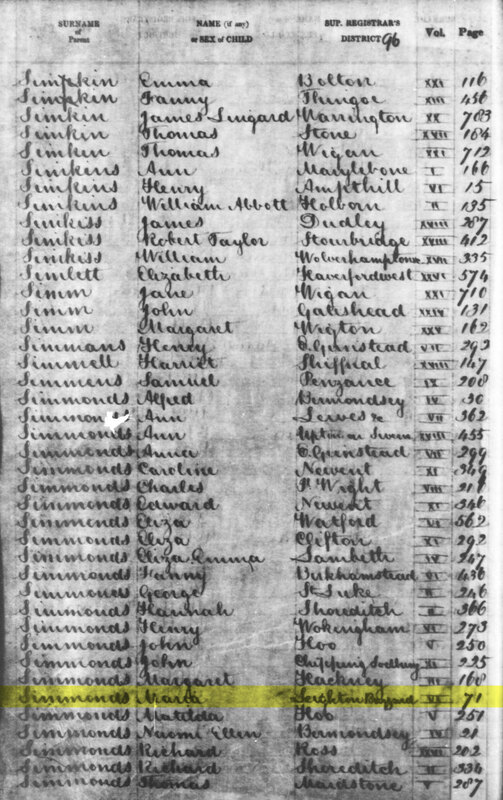 Maria's husband Edward kept a "family bible" containing names and birth information inside a 1845 copy of "An Historical and Statistical Account of the Isle of Man, Vol. 1" by Joseph Train, FSA Scot, published 1845 in Douglas, London, Liverpool & Glasgow. It is in this book that Ed documents Maria's full name. B Maria's obituary echos a biography of her father (including other sources) and states that the family arrived in the USA in 1842, returned to England in 1847, and came back to Ohio in 1852. While I am now inclined to believe that the family returned to England early on, I do not believe the stated time frame is accurate. 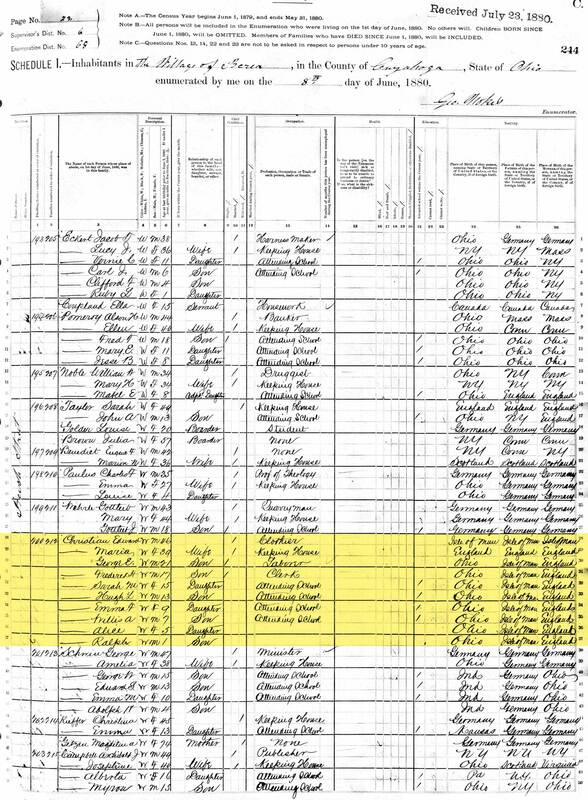 The family is officially documented on the 1850 US Federal Census as being in North Royalton, Ohio at the time when they are supposed to be living in England. 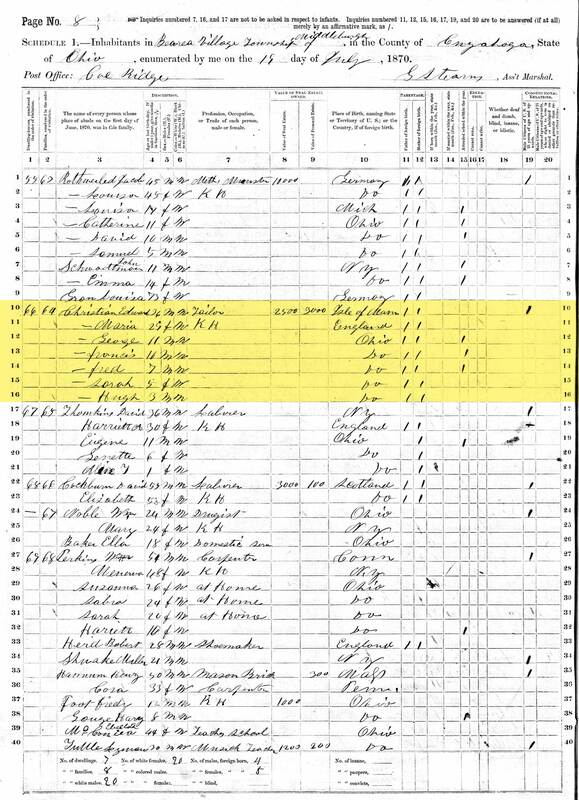 I have also been unable to find the family on an immigration manifests returning to America around 1852. I may have uncovered a reason for the family's return to England. I have been unable to located any records of George's sister Rachel or her husband Ethelred in America. At this point I believe Ethelred passed away and George took Rachel back to England where it appears she remarried in 1849 to a James Darvill. 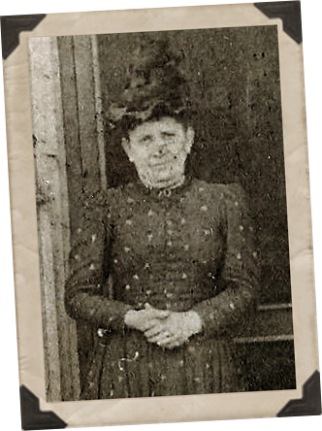 She lived in Tring until her death in 1892. 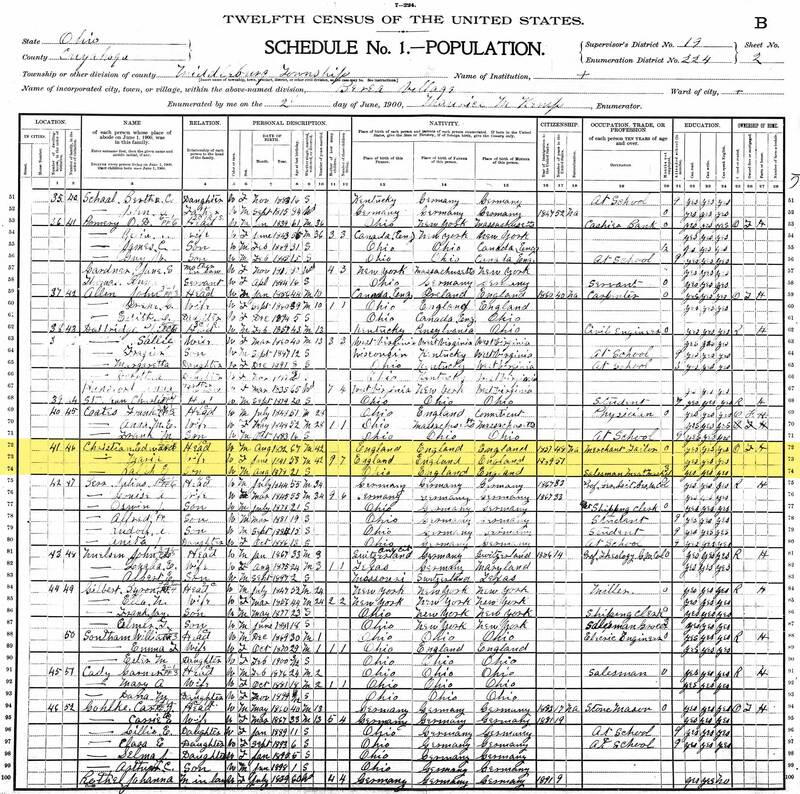 C Maria's birth was registered under the name Maria SIMMONDS. This mirrors the registration of her brothers Thomas and Edward births. Edward's death a few weeks after his birth is also under SIMMONDS. 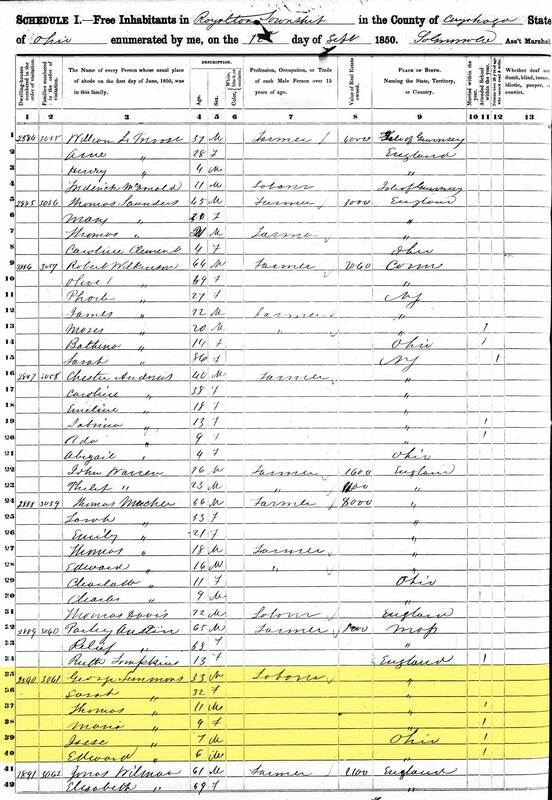 This is in stark contrast to marriage record of aunts and uncles who were written as SIMONS and census records listing SIMMONS. All of this just shows there was no emphasis on spelling, only fairly accurate pronunciation (and a silent "d"?). 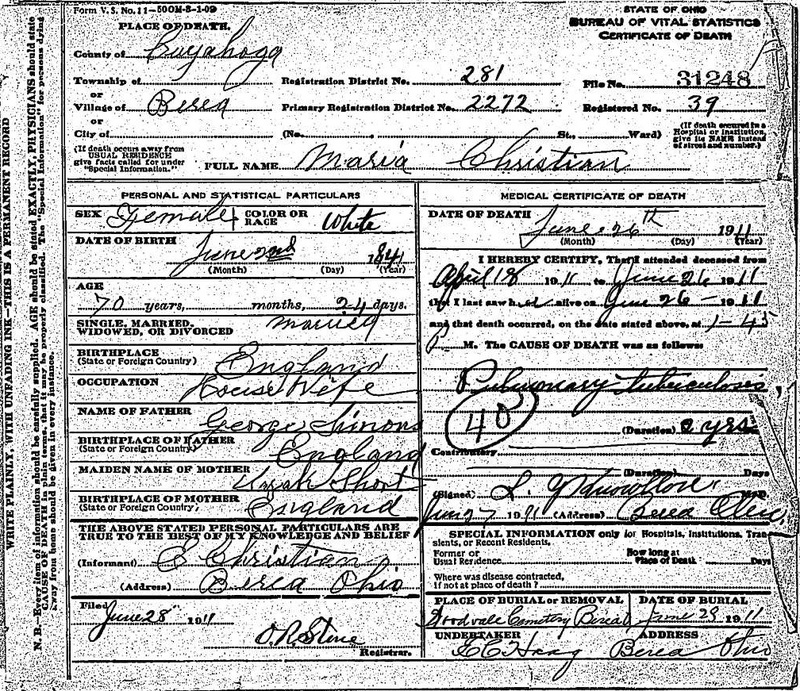 1 Maria Christian, "Ohio, Deaths, 1908-1953"; "Ohio, Deaths, 1908-1953," index and images, FamilySearch (https://familysearch.org/pal:/MM9.1.1/X8DC-B9G : accessed 08 Feb 2014), Maria Christian, 26 Jun 1911; citing Berea, Cuyahoga, Ohio, reference fn 31248; FHL microfilm 1953043. 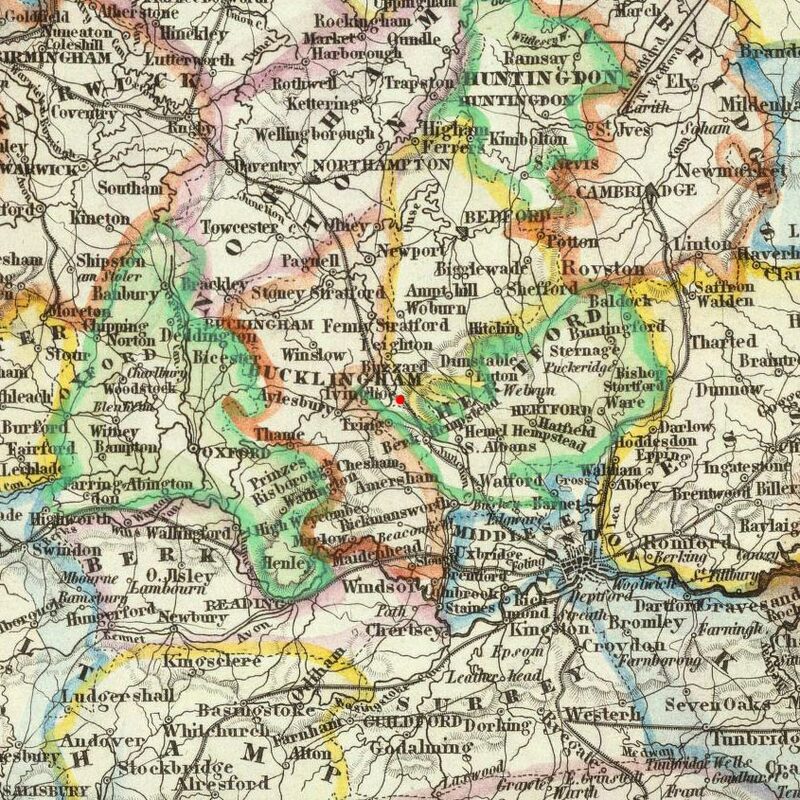 2 1841 England Census about Mary Simmons; Class: HO107; Piece: 50; Book: 1; Civil Parish: Ivinghoe; County: Buckinghamshire; Enumeration District: 1; Folio: 4; Page: 2; Line: 19; GSU roll: 241215. 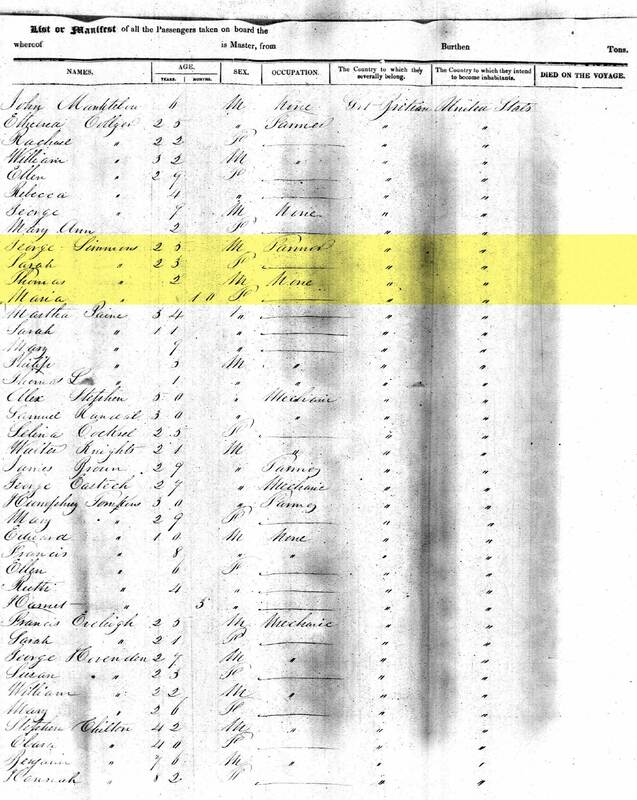 3 New York, Passenger Lists, 1820-1957 about Maria Simmens; Passenger Lists of Vessels Arriving at New York, New York, 1820-1897. Microfilm Publication M237, 675 rolls. Records of the U.S. Customs Service, Record Group 36. National Archives at Washington, D.C.; Year: 1842; Arrival: New York, New York; Microfilm Serial: M237; Microfilm Roll: 48; Line: 12; List Number: 407. 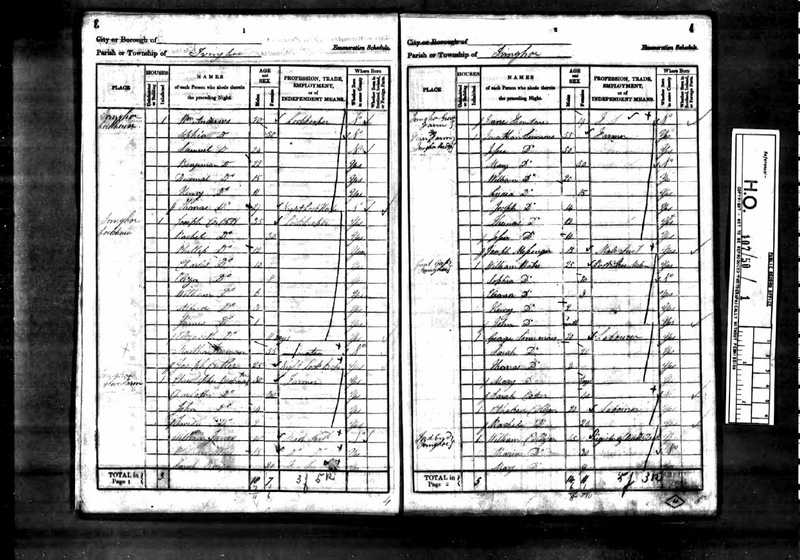 4 1850 United States Federal Census about Maria Simmons; Year: 1850; Census Place: Royalton, Cuyahoga, Ohio; Roll: M432_673; Page: 158B; Image: 510. 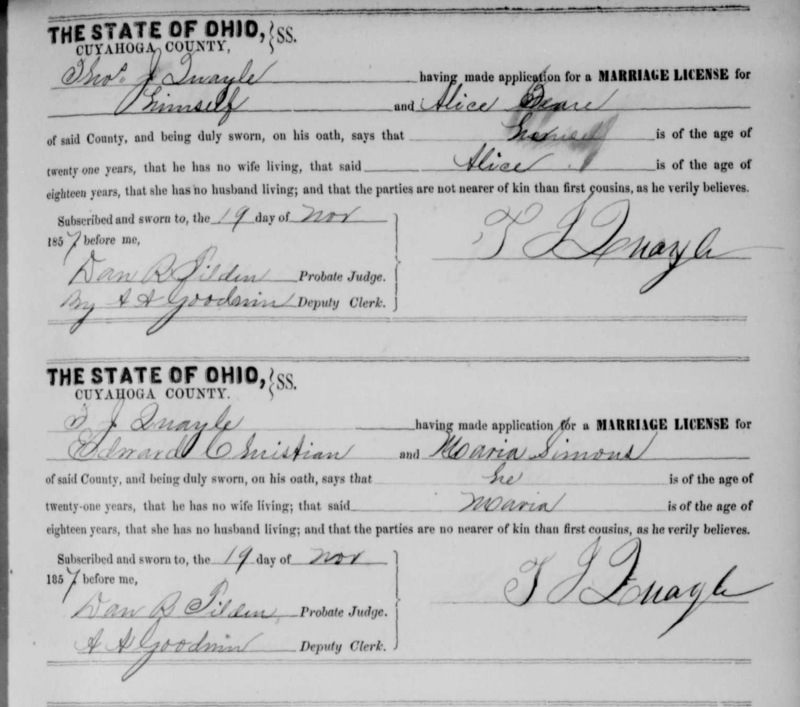 5 Edward Christian, "Ohio, County Marriages, 1789-1994"; "Ohio, County Marriages, 1789-1994," index and images, FamilySearch (https://familysearch.org/pal:/MM9.1.1/XZJD-PHW : accessed 08 Feb 2014), Edward Christian and Maria Simons, 26 Nov 1857; citing Cuyahoga, Ohio, United States, reference Page #16; FHL microfilm 877914. 6 Christian-Simons 50th Anniversary Article, 1907; Unsourced Newspaper Clipping; Most likely from a local Berea/Middleburg Paper; Christian family papers in Kathryn Lowe's Family History Archive. Currently in the care of Eric Lowe; Title: Half A Century - Mr. and Mrs. E. Christian Celebrate their 50th Wedding Anniversary. 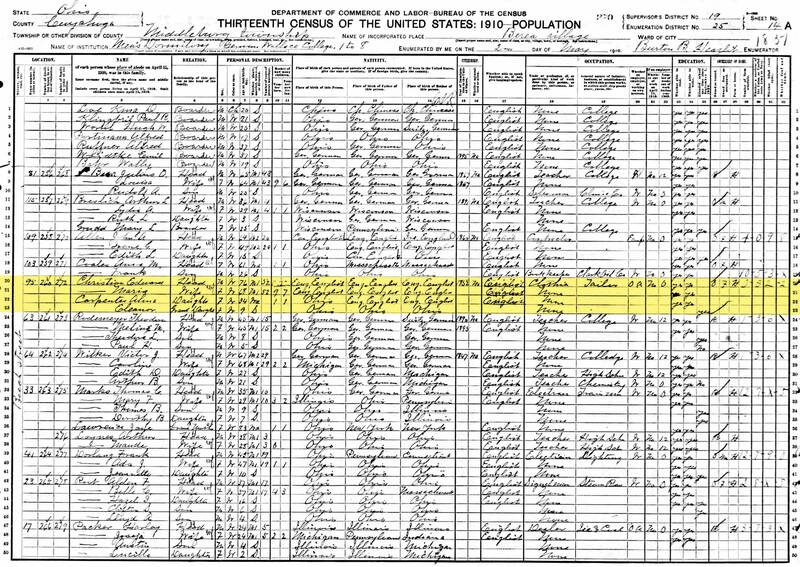 7 1880 United States Federal Census about Edward Christian; Year: 1880; Census Place: Berea, Cuyahoga, Ohio; Roll: 1009; Family History Film: 1255009; Page: 244C; Enumeration District: 068; Image: 0637. 8 Obituary of Edward Christian, 1917; Unsourced Newspaper Clipping; Most likely from a local Berea/Middleburg Paper; Christian family papers in Kathryn Lowe's Family History Archive. Currently in the care of Eric Lowe; Title: E. Christian. 9 The History Of Berea (Quarry) Lodge - The First 100 Years; 100th Anniversary Booklet; Berea Masonic Temple; Berea, Cuyahoga, Ohio; (http://www.quarry382.com/QHistory1.html); Visited: 07 Feb 2014. 10 Berea Board of Education about Edward Christian; History of Cuyahoga County, Ohio. With portraits and biographical sketches of its prominent men and pioneers (1879); Page: 481; Author: Johnson, Crisfield & D.W. Ensign & Co; Publisher: D. W. Ensign & Co.; Call number: F497.C9 J6. 11 Mayors of Berea about Edward Christian; Historical facts concerning Berea and Middleburgh Township Berea, Ohio, by Shaw, Willard H.; Mohler Printing Co.; 1936; 54 pgs; Mayors of Berea, pg. 6; 1896-1897 - E. Christian. 12 Men of Grit and Greatness about Edward Christian; MEN OF GRIT AND GREATNESS: A Historical Account of Middleburg Township, Berea, Brook Park and Middleburg Heights, by Walter F. Holzworth; 1970; 217 pages; citing Page: 76. 13 Men of Grit and Greatness about Edward Christian; MEN OF GRIT AND GREATNESS: A Historical Account of Middleburg Township, Berea, Brook Park and Middleburg Heights, by Walter F. Holzworth; 1970; 217 pages; citing Page: 137.